Aberdeen have won seven of their last nine games, each by the smallest of margins, but finding a way to see out those matches has been a measure of the Pittodrie side as they crank up the pressure at the top of the Premiership table. 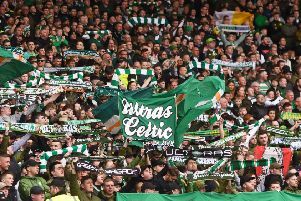 Winning games by a goal has left them a single point behind leaders Celtic with the number of games remaining down to single figures and, with the finishing line in sight, they now have a single vision. Playing in his 100th game for Aberdeen, Logan’s 71st-minute diving header was enough to dismiss a Kilmarnock side who had shown a lot of spirit in the second half of the encounter, belying their standing as one of the clubs embroiled in the relegation and play-off battles, as they battled to get back on level terms. It was parity that would not have been possible if Derek McInnes’s men had made more of the first-half dominance. The home side had taken the lead which their play in the opening period of the contest merited. The upright and then Kilmarnock goalkeeper Jamie MacDonald had foiled their goal efforts early on, but when Ash Taylor was allowed to rise unchallenged to meet a 36th-minute corner, it was no surprise that he opened the scoring. A few half-time truths had galvanised the away team and when former Aberdeen striker Josh Magennis scored three minutes after the interval Aberdeen needed to show some steel. In the lunchtime fixture, title rivals Celtic had gathered all three points leaving the Dons no room for error and they showed determination to withstand Killie’s shift up through the gears and find something else in their own game. “If we had lost points it would have been a very poor result for us,” admitted Logan. “We definitely deserved to win and just had a slack ten minutes, but we did well to dig in and show what sort of team we are. “We have eight games left, eight cup finals, and every little helps and matters. It is going to be like that in every game. When you are on top so much and you get the first goal, you need to go and get that second and third. His header with less than 20 minutes remaining reasserted their lead but, with just one goal in it, nerves were jangling in the stands, with fans willing their men to upset the odds and get the wins required to deliver the biggest prize in Scottish football. But while it would be a shock, the fact they are still in there competing despite their desperate run of losses in September/October, shows the quality of the campaign as a whole. According to Logan, no-one at the club is amazed that they have been able to make a real fist of the challenge. “There is no surprise in it. We’ve had a few games where we have slipped up and maybe we shouldn’t have but that is football,” he said. “That is how it is. People say Celtic should win the league but why should they? “They have a bigger squad and budget but we still have good players in there, players who want to win and work hard every day to win medals. “That is what we are at this club for and it is good it is that close because it hasn’t been that close for a long time and it is really good, especially for the fans.